White signifies serenity, peace and purity. It is the perfect choice for the bedroom which is a haven for stressed work weary people. 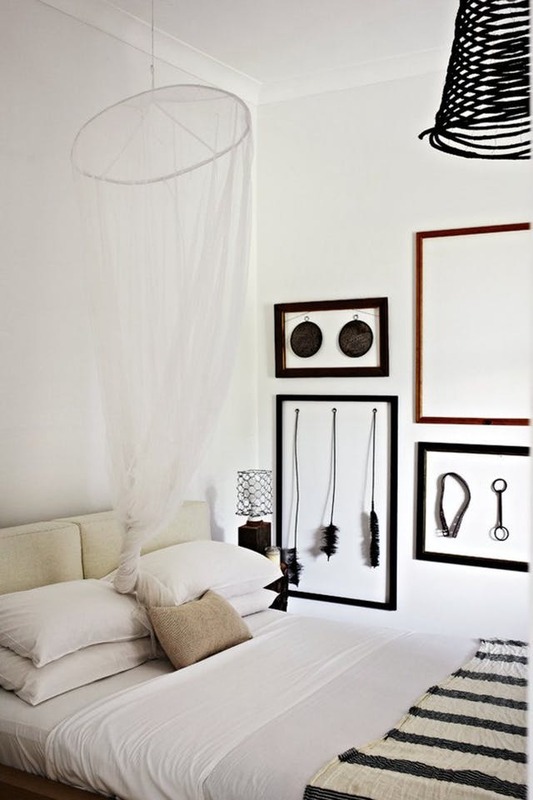 White is a calming color and makes perfect sense for your bedroom. 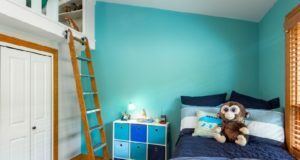 The bedroom is generally a low traffic area and you can afford to use a pale colour as it is less likely to get dirty. 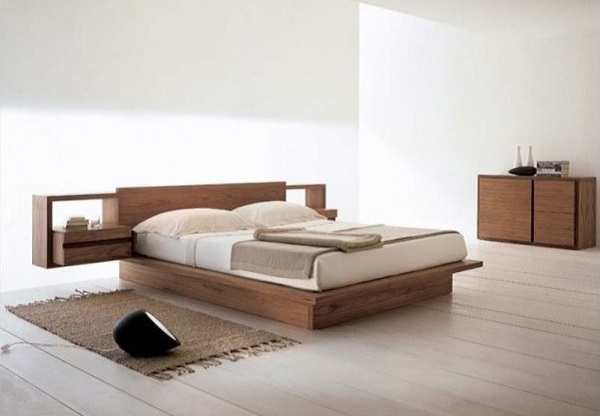 White can create a zen like atmosphere very conducive to sleeping or relaxing. White too has many shades ranging from a bright stark white to warm off whites and creams. The different shades create different moods in your bedroom. 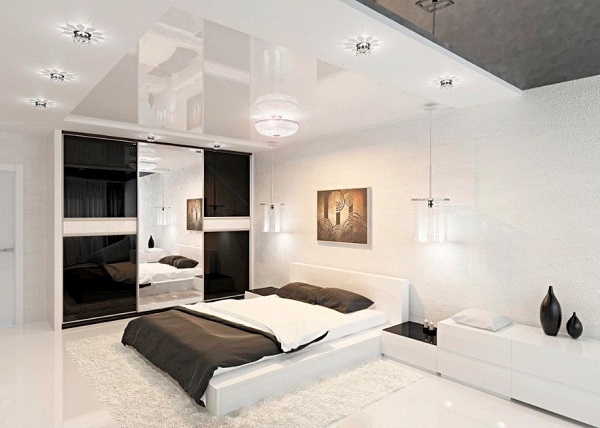 Stark whites with glass and chrome furniture, large bay windows create a visually stunning bedroom. Bright white can lend an edge and make for a modern and chic décor. 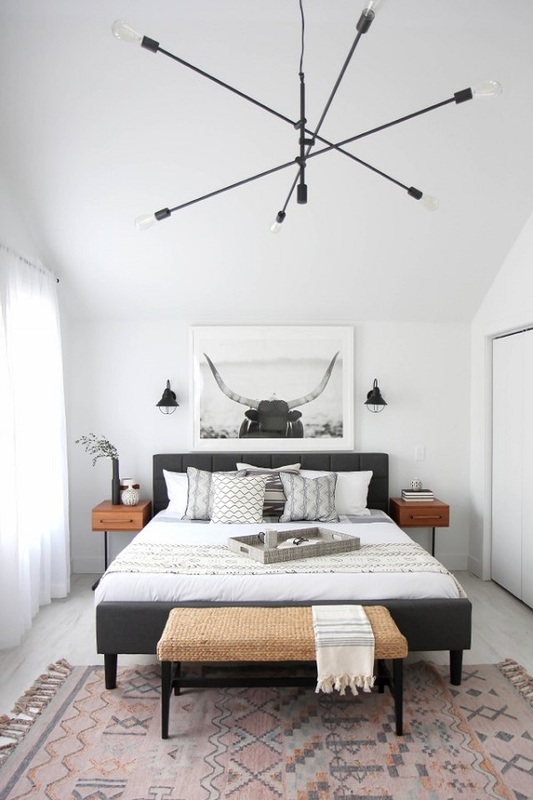 “This gorgeous bedroom uses texture as well as interesting architecture to catch the eye. There’s a lovely view out the window, but I’m drawn to that fantastic architectural detail behind the bed. When you keep the color palette so restrained and neutral, you can (and should!) add drama via unusual shapes and textures,” quoted interior designer Jennifer Ott from jenottdesign. Warmer shades of white are more soothing and inviting. They create a cozy ambience which is more traditional in approach. Off whites to cream are often relieved by pops of bright colors to relieve the monotony. Red, pink, apricot and other pastel shades of blue, yellow or green are perfect foils to softer white shades. This is one of the most classical combinations while decorating a bedroom. Using beige and white theme to decorate space, gives the feeling of royalty and luxury. Amazing wall with terrific lightening work, expensive chandelier enhances the beauty of room. 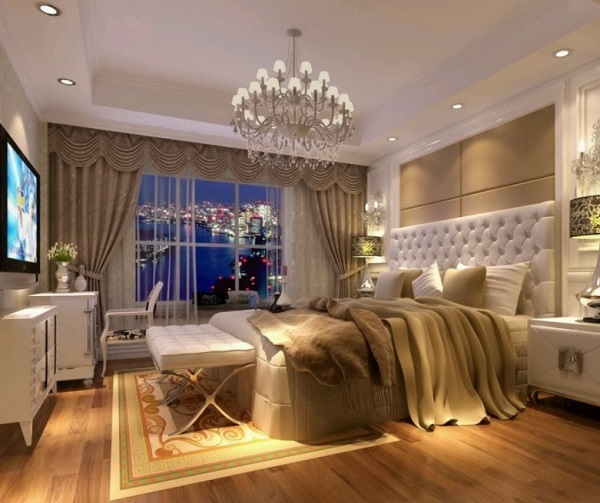 Just have a look at this bedroom design to get best idea about white & beige color theme. While full white rooms look gorgeous, you might want to break the monotone and also set it off by adding a darker flooring and furniture trim. Black or dark Gray and blues create a dramatic effect when used as a contrast to stark whites. Glass topped tables, mirrors, large windows with sheer drapes look sensational. On the other side of the white spectrum, softer and warmer hues go very well with dark wood floors. Similar hues may be used in the furnishings to create a warm glow. While whites look great on their own pairing them with wooden hues with blonde undertones works very well. “White makes old things seem more current. White rooms are more complex than they appear, because there are no distractions. Every choice becomes critical. Stain wood floors white to create a greater sense of space. Build rooms around art,” told Darryl Carter, author of The New Traditional. Small splashes of red, orange or other warm shades may create pops of accents which break the starkness. These could be reflected in rugs, furnishings, window treatments or accessories like planters, photo frames or even paintings or prints on the walls. 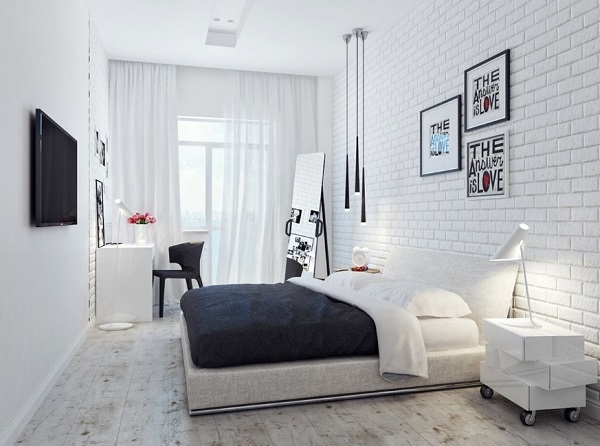 White is a stunning shade to use in your bedroom but there are a few important considerations. White is a minimalistic colour. Clutter is an absolute no-no. The fewer accessories the better the effect is. Fully white bedrooms cry out for simplicity. Furniture should have simple lines. Fussy furniture or furnishings spoil the vibes. You must be finicky about cleanliness to ensure a pristine look. Large windows that bring the outdoors inside are one of the features that accentuate the white bedroom. 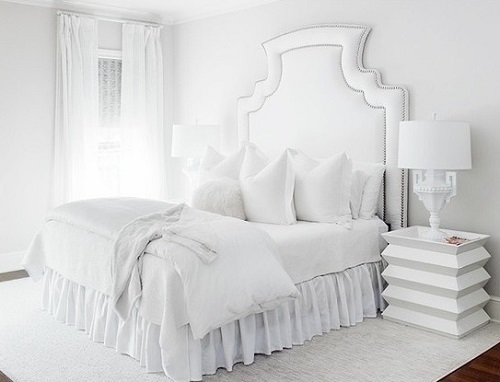 A mesmerizing view is a definite plus to an all-white bedroom. It creates illusion of space and lightness. Fine, sheer and floating drapes can add a soft and ethereal touch to your white bedroom. Textures play an important role in defining the whites in your bedroom. A classy veined marble flooring with textured white walls, matte white wood furniture and sheer drapes create magic. You should experiment with textures on floors, furniture, walls and furnishings to create a study in contrasts. So go ahead and enjoy your white bedroom!